A smooth flight, arriving at 7 am in the pitch black of a Barcelona morning. They organize their hours so that they have to sleep in and then have to stay up late. Eminently sensible! I am quickly reminded that I simply enjoy being here. I have written about what draws me, but it simply boils down to – I enjoy being here, I enjoy living in Spain, in Spanish for a few weeks. 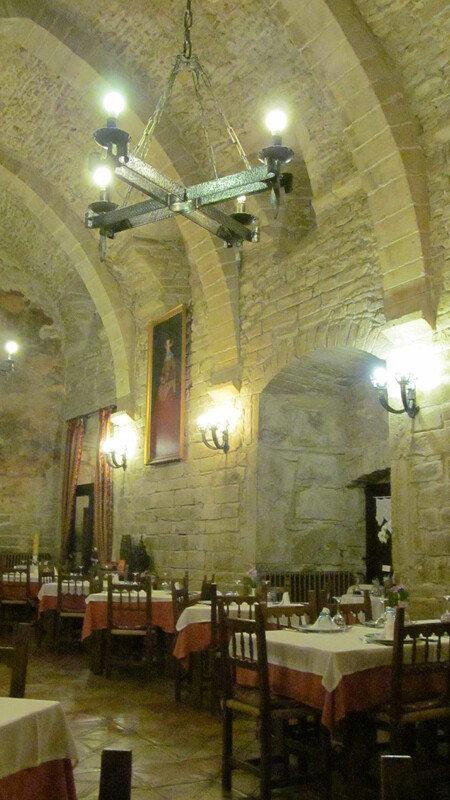 I reserved a parador, a chain of upscale hotels for my first night, near the small city of Vic, north of Barcelona. The internet gave me the idea that it looked out over a lake. I was enthralled as I made my way up into the hills through pine forests to discover my room looked out over this. My first post from Spain and I am going to make you suffer, or thoroughly enjoy, a delightfully bad pun, or a marvellously inventive one. 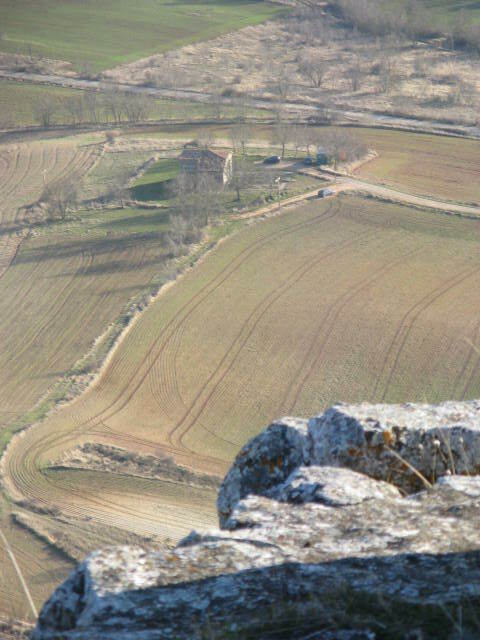 Spain is crisscrossed with numerous mountain ranges, sierras, which cut through the lower valleys and isolate areas. Inevitably rivers have eaten away at the rock, digging at times deep ravines. Spain is absolutely gorge-ous! Come on, it wasn’t that bad, it was that good! A few years ago I introduced by big brother and sister-in-law to a number of them. 300 kilometres further north, I find myself in the isolated hilltop village of Roda de Isábena, a village with a Romanesque cathedral of all things, the smallest town to have one. The 300 kilometres presented regular changes in topography; pine-clad hills as if I were traveling through a national park, giving way to broad valleys with intensive cereal farming, then semi-arid areas (the mountains creating microclimates, some of which make survival tougher) with olive orchards, villages perched on rocky crags keeping a watchful eye the fields, a few vineyards. The final 30 kilometres seemed to be a continual gradual ascent through mainly scrub land but suddenly I had arrived at the edge with another broad farming valley far below me demanding of me and my car a seemingly endless series of switchbacks to reach. I now am in a comfortable and quiet room overlooking the valley, beside the cathedral. 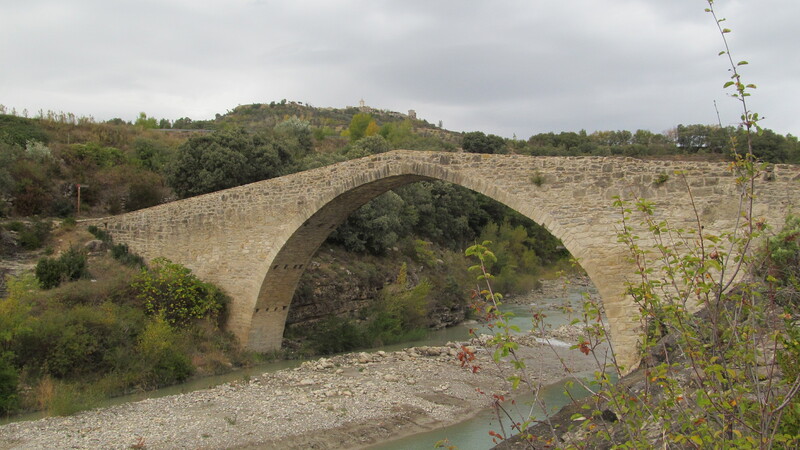 I headed off on foot back down the winding road that had brought me up to Roda in order to visit the 12th century medieval bridge below. You can just make out the towers of Roda in the distance. According to a sign, it’s about 2 k from the bridge. Contrary information (my very own ‘fact checkers’) is persistently forthcoming from my legs and body; constantly, steadily and I almost want to say steepily, I made it back up to the village. Believe me, the accountant in me counted the steps, 3000 some. Every 100 pasos convinced me that I was making progress. And, I actually got stronger as I got farther along and closer to my goal. LIke the old grey mare knowing that the stable is the reward. The more often I travel here, the more I am aware of the food and the way in which eating defines a culture as much as anything else; it is all in the small details. A few examples, one with photos. Breakfast on my first morning, a restaurant in a village with an amazing 11th century monastery. 10:30 am. I order a tortilla, a light omelet in this part of the country. A dictionary of their food would take many volumes because of the differences across the regions. It comes with toast and a ripe tomato that explodes with joy in my mouth. The couple next to me, in animated conversation, are each eating a large ring of homemade sausage, toast with slices of cheese, washed down with a litre of red wine. Breakfast! Later at lunch, I am enjoying a four course meal in a village restaurant near the parador. Salad, with another one of these tomatoes, a roast potato dish, and sautéed calamari complete with all the little legs – chiperones they are called in some places here. The table next to me is given a platter that could have been my second choice – a half dozen or so chunks of their home-made cured meats, pork, venison, wild boar, etc. They simply slice off what they want to consume. Their third course would came later, another meat dish. And, as I tell everyone, you have to consciously try to find overweight Spaniards as you go about your own day. Food defines a culture! This evening in Roda de Isábena I had to wait until 9 o’clock for dinner. What a treat! In a room in the monastery attached to the cathedral, just off the cloister. Walking to find it in the darkened streets of this village was really a delight. I found myself in the13th century refectory where the monks ate, here with simplicity. This was a Cistercian house. Austerity, simplicity, work and prayer were the orders of the day. The traces of wall painting are from the 14th century. An enjoyable evening! And the bottle of white wine was almost empty! I got a bit silly! This entry was posted in Uncategorized on October 18, 2012 by agnotarte. I leave on the 16th. It will be my seventh trip to northern Spain in 4 years. Today I would like to share a brief overview of some very different passions which continue to draw me there and which will consume me this time as always. My strange bedfellows! Early medieval architecture, from the 7th century to the 12th draws me into the remote valleys across the north in search of tiny rural churches. Gothic bores me, the baroque appalls me, and cathedrals are curiosities almost to be avoided, statements primarily about power – “We’re here, we dominate totally, don’t mess with us!” and “One day you will understand the direct connection between our over-the-topism and your contemporary casino architecture and the excesses of Las Vegas!’ It is my blog and I can be as opinionated as I want to be. I am drawn to small rural parish churches and isolated ermitas constructed between the 7th and 12th centuries. 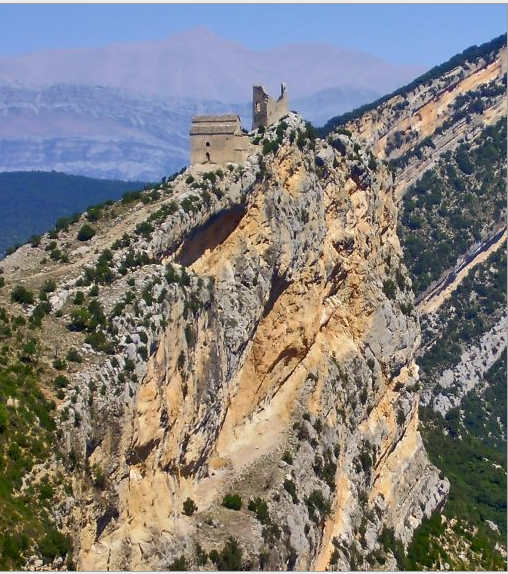 I hiked to this complex of church and fortified tower from the 11th century – a 45 minute steady climb to this exposed ridge in northern Aragon, part of a system that was built to stabilize defence and resettlement in this area in the early days of the reconquista, the century-long struggle to regain the peninsula from the Moors. A three-nave church and octagonal tower, with amazing views of the river valleys to the north and south (40 – 50 kilometres?) and the ever-surrounding mountains. Breathtaking! And to reflect on the amount of effort needed to build these over 1000 years ago in the middle of nowhere! To visit the tower, I had to use the front and back doors of the church; there simply was no room along either side of the first building. I do love to hike; choosing isolated churches gives me plenty of opportunities. Do I choose these places in order to hike or do I simply set off because I want to see these places? A chicken or egg question; ¿el huevo o el pollo? 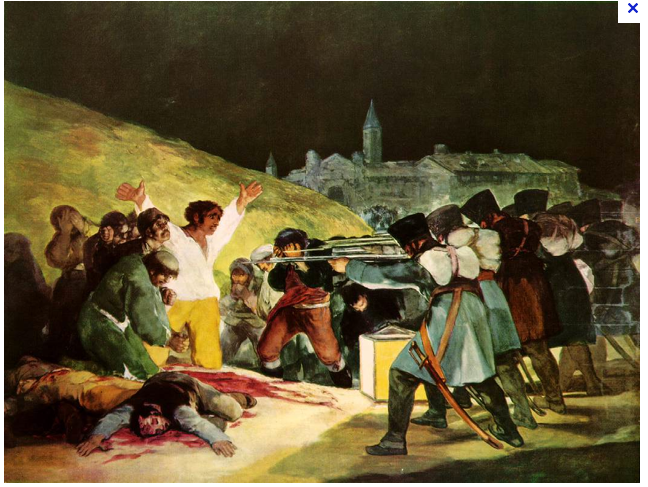 I would like to thank Arthur, a professor emeritus of history at York University, for introducing me to another one of my passions, the art of Frederico Goya. Whenever in Madrid, I spend a whole day just with this man’s art, in the Prado and in a number of other key locales. I have been to Zaragoza to visit his birthplace and have spent spend hours in the art galleries there devoted to his work. When in the Prado, I simply stand in front of this immense canvas, The Third of May, and weep. I am particularly moved by his etchings which catalogue our foibles, the disasters of war, and his passion for bullfighting. Each time I return to Spain, I enjoy the food more and more. My comfort level with menus and inquiring about any particular item has improved. I have also discovered the northeast, the region of Catalonia, facing the Mediterranean, outward looking, always ready to embrace distant influences, Italian, French, North African, Middle Eastern. I was eating lunch in a tiny village in an ancient valley high up in the foothills of the Pyrenees, a valley whose churches contain a breathtaking treasure of Romanesque wall paintings. I ordered the ubiquitous specialty, roast lamb and was assured by the dueño, that the lamb had come from one of the flocks I had only just seen wandering with their shepherds within a few kilometres of the restaurant. I also ordered a salad, with shrimp and a kind of flat green bean. This is what was presented to me. 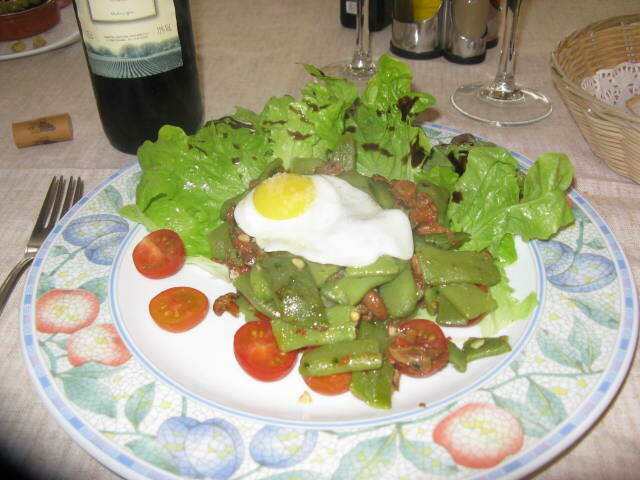 The two large shrimp were hidden underneath the greens; the egg came as a complete surprise. The daily lunch menu usually includes a small beer, soft drink, bottled water OR a bottle of the local year-old wine. You learn quickly to enjoy a glass or two and not to try to finish the bottle. 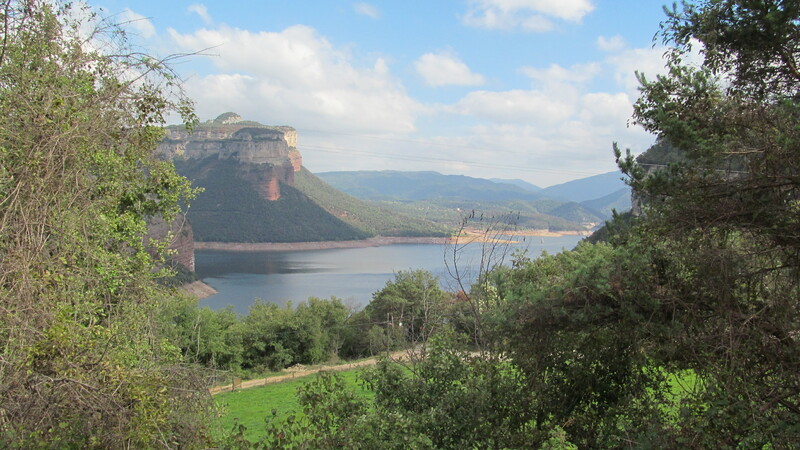 Early medieval architecture, hiking, Goya, the food and finally futbol. Gradually over the past 12 -14 years, I have learned to love, appreciate and tentatively understand soccer. I saw my first live game this past April, Atletico Madrid. In 2011, I made a pilgrimage to Camp Nou, the stadium where el azulgrano plays and triumphs, Barcelona FC. I wrote about my visit to this shrine extensively in one of my emails, as a pilgrimage with so many of the same elements of a medieval pilgrimage, including relics (trophies and dried up old sneakers of famous players) and the side chapels for individual saints . Yes, this one is for quite the well-known miracle worker, Leo Messi. 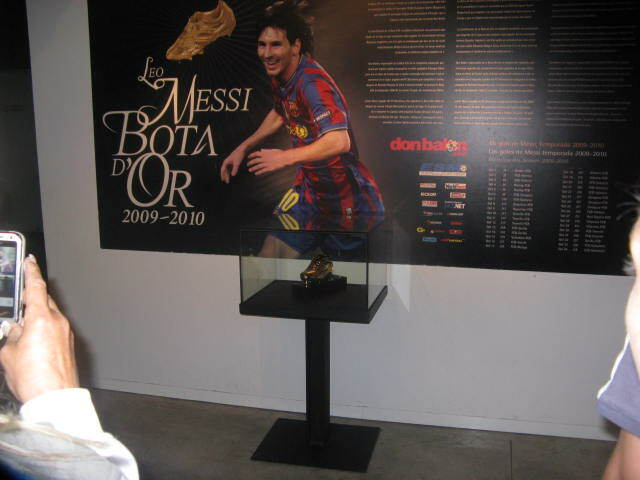 Along with hundreds of other faithful fans (there would have been thousands over the course of the day), I filed past his photo and the Golden Boot as the best player in the world (now three times), and then continued to the other focal points, all in a spirit of reverence, almost like being in the presence of a ‘power greater than ourselves’. November 4 will hopefully see me seated with 90 thousand of the Barca faithful, los culés, in the stadium. I have started learning the words in Catalan to the Hymn to Barcelona that they sing at the beginning of each game. By then, I will have hiked to see some amazing small rural churches and scenery up in the foothills, stood before some Goyas that I will not have seen before, eaten well, cheered on Messi and friends and hopefully have discovered a new passion or two to add to the ones that keep bringing me back. I trust implicitly that Spain has much more to offer me. I am already thinking about next spring. This entry was posted in Spain on October 11, 2012 by agnotarte. 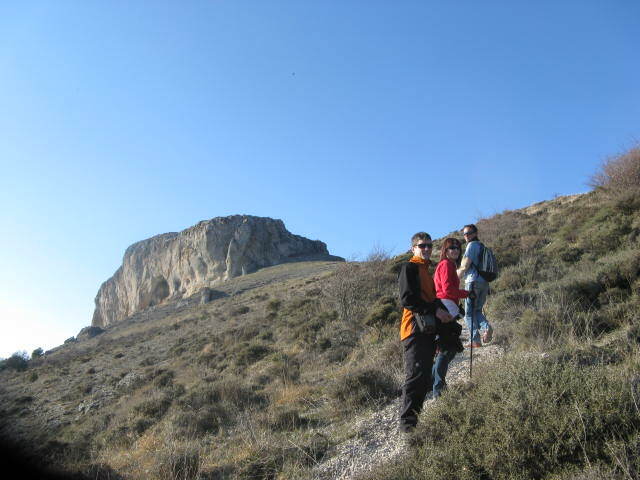 I have been on top of this outcrop of rock that looks like it belongs in Arizona; it is called La Peña de Lara. It was on a beautiful 20 degree day in late February 2009. 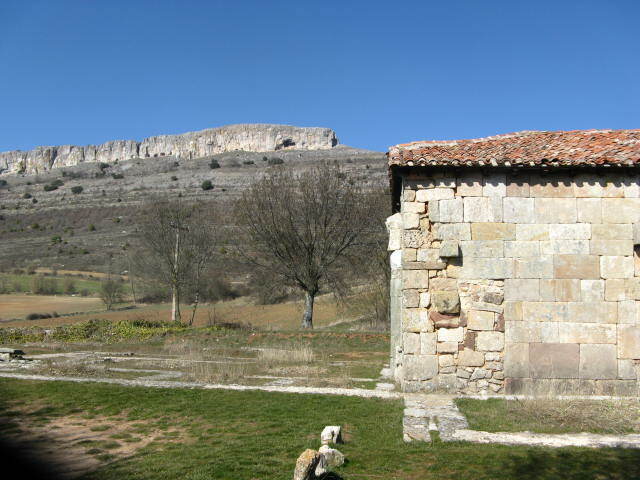 It is located about 30 kilometres south of the ancient city of Burgos, which is itself about a three hour fast drive north of Madrid. It is in this area that I feel most at home in Spain. In combination with some other factors, this piece of rock is what ‘hooked’ me to Spain and to this part of Spain in particular. Estoy enganchado de España. I say this many times a day when I am there. I am hooked on Spain. That late winter day a few years, I had travelled across the country, my goal being to see two small 7th century Visigothic churches, both situated out in the middle of nowhere, probably one of the reasons how they somehow survived down through 14 centuries. I arrived at the church of Quintanilla de Las Viñas around three, took a pile of photos, and sat down to chat with the full-time guide, Antonio. This church is a gem, what remains of it, with a variety of and quality of sculpture that reveals that the Spanish instinct for the visual has very deep roots. I might write a post some day on it, but then you would have to endure Ed in “his passion for all things Visigothic hat“. But at least that day you could choose not to read my post. I would warn you. Here is a photo of the tiny church with the Peña framing it (its nave collapsed many centuries ago – if you look closely to the left of the church you can spot remnants in rock the nave’s foundation). It was a quiet season inevitably and Antonio was using the time to teach himself how to play the guitar. He was warming up with Greensleaves, can you believe it? My Spanish was still very tentative. Some of his friends arrived, a young couple, Patricia and Luís. I stayed around. At 5 o’clock the church was locked and they invited me to climb the Peña with them. What the heck! I headed up the trail. They knew the route well and it took us a little over an hour. Here are the three caballeros from up top. The view was magnificent, hills, cultivated fields, even snow-capped mountains. In the distance behind is the site where EL Bueno, El Malo y El Feio (The Good, The Bad, and The Ugly) was filmed. The landscape easily becomes the American southwest. 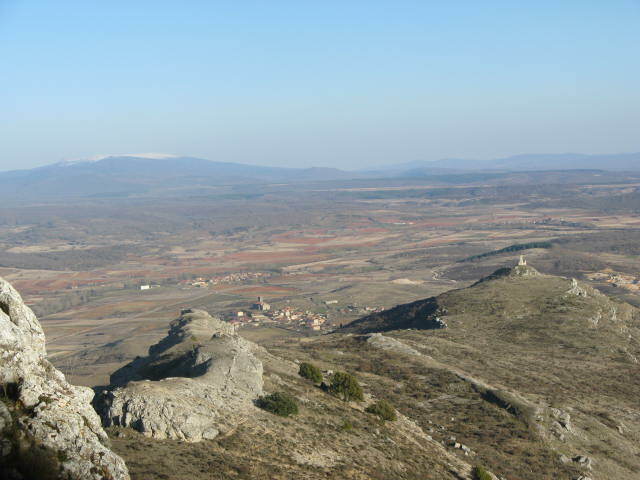 Here is another view; in the middle foreground on the right are the ruins of an 11th century castle, the first one established south of the northern mountains to initiate what the Spanish call the Reconquista, the taking back of the peninsula from the Moors (completed in 1492). In the foreground is one of many small villages and further away the ever-present snow-capped mountains. I travel here for the most part in the spring and I see snow-capped mountains virtually every day. And finally the tiny church from up top, from the edge of a ledge where the four of us sat for awhile chatting. My professor of Art History at York University has been to this church; I was very happy to share this photo with him to add to his collection of 300,000 photos, the others skillfully taken by him. I get a kick out of sharing my discoveries with him. He helped imbue me with this passion for the medieval. Thanks Malcolm! The hike up, the ongoing conversation, the budding friendships, the hike down. And, suddenly, it was after 7 and I had nowhere to stay. Antonio and I exchanged email addresses. I took the photo that I am now using on every post. I headed back 25 km for so to an ancient town, Covarrubias, that I knew from the guide books and had seen en route. I got myself a room in the local hotel for two nights. And, every time now that I return to Spain, I return to Covarrubias to the same family-run hotel and restaurant where the host had made me feel very welcome. I have taken my brother and his wife there and I have come to feel at home in this village and in the surrounding countryside. 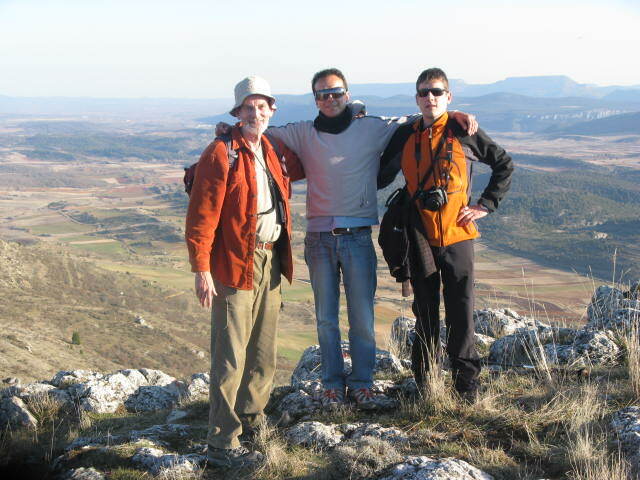 And, I always spend time at the little church with Antonio, helping him learn English, hiking with him in the area and enjoying playing the guide to those who show up for the first time to see the Visigothic ermita. Antonio and I stay in touch a couple of times each month. He emailed today that he has bought himself a motorcycle. Another post and I might talk about Covarrubias, but this accidental hook explains as much as all the other factors how I have come to love Spain so much, its people, its geography, its history, and particularly its art and architecture. Adios. Hasta luego! Estoy enganchado de España! This entry was posted in Uncategorized on October 1, 2012 by agnotarte.